And now Servius thought to establish himself in his kingdom. And first of all, lest the sons of King Tarquin should so regard him as the son of Ancus had regarded King Tarquin, he gave his daughters in marriage to the two young men (for King Tarquin had left two sons, Lucius and Aruns by name). Nor yet did the counsels of man avail to change the decree of fate, that there should rise up against the King foes from out of his own household, as, indeed, will be shown hereafter. Yet for a while all things went peaceably. First the King got himself great renown in a war with the men of Veii, with whom the truce had expired by lapse of time. These he put to flight with great slaughter, and so returning to Rome was manifestly acknowledged not by the Senators only, but was also by the people. And now he set about the work of ordering the state, dividing the citizens according to their birth and to that which they possessed. First of all he put the Senators, and after them such as served in the wars on horseback, and these he called knights. And the rest of the people he divided into classes according to the armour with which they were able to furnish themselves for war. The first class were they that had one hundred thousand pounds of brass or more; and these had for armour a helmet, a long shield, a cuirass, and greaves upon their legs, of brass all of them, and for warfare a spear and a sword. In this class there were eighty companies of a hundred, forty of the elders that should defend the city, and of the younger that should go and fight abroad forty also. The next class to these had a short shield for a long, and lacked the cuirass; and after these another that had the same arms, only wanting the greaves. The fourth class had nothing of armour, and for weapons a spear and a javelin; and the fifth slings and stones. These last were such as had eleven thousand pounds of brass; as for such as had less they were free from service in war. When this ordering was finished, he commanded that the people should assemble themselves on the field of Mars; and when their number was counted, it was found that they were eighty thousand in all. King Servius also was minded to enlarge his kingdom by including within it the nations round about, seeking to do this not by arms so much as by counsel. And first he joined the Latins to the Romans, contriving the matter in this fashion. There was in those days a famous temple of Diana at Ephesus which the cities of Asia had joined together in building. Now King Servius would often speak of this thing to the Princes of Latium, to whom, indeed, he was careful to use much hospitality, declaring how noble and excellent a thing it was that they who dwelt in the same land should have their gods also and worship in common. And when he had ofttimes used much argument to this purpose, at the last he persuaded them that the cities of Latium should join together with men of Rome and build a temple to Diana, and that this temple should be at Rome, whereby it was confessed that Rome was the chief city. As for the Sabines this same end was brought about in a different fashion. There was a certain householder of this nation that had born upon his farm a heifer of marvellous greatness and beauty. How great it was might be seen from the horns of the beast which hung in the front of Diana's temple for many generations. Now the birth of this great creature was counted for a portent; and the prophets prophesied that the rule should belong to that nation whose citizens should offer it in sacrifice to Diana; and this prophecy came to the ears of Diana's priest. The Sabine therefore, so soon as a fitting day for sacrifice was come, brought the great heifer to the temple at Rome and set it before the altar. And when the priest saw it he perceived from its greatness that it was the beast of which the prophets had spoken. Therefore knowing what they had said he spake to the man, saying, "Friend, what is this that thou art minded to do? Wilt thou do sacrifice to Diana profanely, not having first cleansed thyself? See now where the Tiber flows in the valley beneath. Do thou therefore bathe thyself therein and so offer thy sacrifice." And when the man, being very scrupulous to do all things in order that the thing might have its due fulfilment, went down to this river, the priest took the heifer and offered it up to the goddess. This thing was marvellously pleasing to King Servius and to all the people. The King, having now enlarged his borders, divided the land which had been taken from the enemy man by man among the people; and feared not, having gained their hearts by this bounty, to ask them, being gathered together in assembly, "Is it your pleasure that I should reign over you?" To which question there was given such assent as no king before him had received. Nevertheless the son of King Tarquin ceased not to cherish in his heart the hope of the kingdom; to which hope, indeed, he was the more stirred up by Tullia his wife. For now there sprang up in the palace of the kings of Rome a monstrous growth of wickedness, to the end, it may well be believed, that the people might, for hatred of kingship and its way, come the earlier to love liberty. Now King Tarquin had two sons, this Lucius, of whom mention has been made, a haughty and violent man, and another, Aruns by name, that was of a quiet and gentle temper. And as they differed the one from the other, so also did their wives, the daughters of King Servius; and it so fell out that she that had the fiercer temper of the two, a certain Tullia, was married to Aruns, and she that was gentle to Lucius. Now it vexed Tullia to the heart that her husband was of so peaceable a spirit, so that in the end she despised him, and looked to his brother as being the more worthy to be her husband. And the end of the matter was this, that Lucius and Tullia plotted together this great wickedness, that he should rid himself of his wife and she should rid herself of her husband. And this they did; and then the two being thus in evil fashion made one, Lucius took Tullia to wife, the King not hindering the thing, though indeed he approved it not. And now did this wicked woman increase day by day her rage and fury against the King her father. For having done one evil deed she began to compass others; nor would she suffer her husband to rest, stirring him up to all wickedness, and speaking to him in such fashion as this: "Truly I had a husband that pleased me well had I been content to serve together with him. But the husband that I looked for was one that should think himself worthy to be a king, that should remember that he was a son of King Tarquin, that should choose rather to have the crown in possession than to hope for it hereafter. Such an one I thought to find in thee; and if I thought right, then truly I call thee true husband and King, but if not, then I count myself to have suffered loss, seeing that thou art not a coward only, but also bloodguilty. Be up and doing, therefore. Thou hast not, as had thy father, to pome from Corinth, or even from Tarquinii, to win for himself a kingdom among strangers. All things that are about thee mark thee out for kingship, to which, if thou judge thyself unequal, then depart from this place where thou seemest to be that which thou art not." 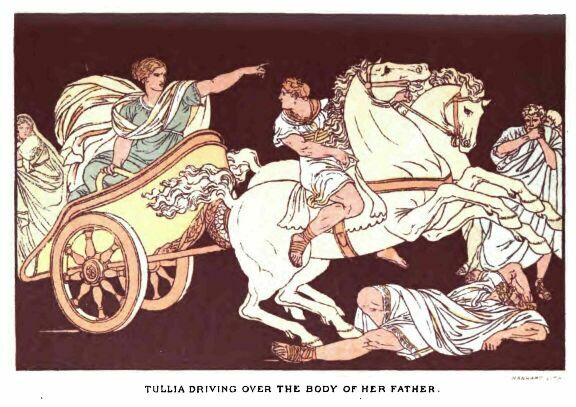 With such words did Tullia daily stir up her husband; thinking shame to herself, if so be Tanaquil, who was a foreigner, had been able to make two kings, first her husband and then her son-in-law, she, being the daughter of a king, could not accomplish as much. Then did Lucius begin to seek favour among the nobles, especially such as were of the lesser houses, and so ambitious of higher place in the State. Some he would remind of kindnesses that his father had done them in past time, and would ask for a like return; and to some he would promise gifts; and all he sought to turn against the King. And at the last, when it now seemed time to make his venture, he burst into the market-place, having with him a company of armed men; and all that stood near being so stricken with dismay that they hindered him not, commanded the herald that he should call the Senators to meet King Tarquin. Nor did the Senators, being thus summoned, refuse to come, for some had been won over to the young man beforehand, and others feared that they should suffer harm if they came not, for the matter was altogether beyond their expectation; also they thought that King Servius had already perished. And when they were were assembled, Tarquin sat down upon the throne and spake in some such fashion as this: "The slave that was the son of a slave-woman seized the kingdom when the King my father had been shamefully slain. Neither was there any assembly held for election; nor did the people give their votes for him, nor did the Senate confirm the matter. By none of these things doth he possess this great dignity, but by the bounty of a woman. And now he, being such an one as he is, favours the lowest of the people, to whom he divideth this land, which is of right the possession of the nobles; in like manner the burdens which at one time were borne in common by all, he putteth upon you; and this ordering of the citizens that he hath lately established, for what purpose is it but that he may know who hath aught, that he may make distribution to the needy?" While he thus spake there came in King Servius, having been fetched by a messenger in hot haste, and cried with a loud voice from the porch of the senate-house, "What doest thou here, Tarquin? How darest thou, while I am yet alive, to call the Senators together and to sit upon my throne?" To this Tarquin made answer, "This throne is the throne of the King my father, of which I, being the son of a king, am worthier than thou that art the son of a slave. Surely now thou hast long enough triumphed over them that are by right thy masters." After this there was a great shouting and tumult, some favouring Servius and some Tarquin; and the people ran together into the senate-house; and it was manifest that he that should prevail in that conflict would possess the kingdom. Then Tarquin, thinking that having ventured so much he must dare all things, laid hands on King Servius and cast him down the steps of the senate-house into the market-place. Then they that accompanied the King, that, is to say his ministers and guards, were stricken with fear and fled, and Servius himself, seeking to return to the palace, and having now reached the end of the street of Cyprus, was overtaken by them that Tarquin had sent to pursue him, and there slain. And men say that this was done at the bidding of Tullia; and indeed it agrees with the other wickedness of this woman. That she rode in her carriage into the market-place, and, fearing not to come into the assembly of men, called forth her husband from the senate-house, and before all others saluted him as King--all this is known for certain. And when he bade her depart to her home, and she had come to the top of the street of Cyprus, and would turn aside to the Esquiline Hill, he that drave the horses drew back the rein and tarried, showing to his mistress the body of Servius where it lay in the street Then did she a wicked deed, whereof there remains a memorial to this day, in that men call the street the Wicked Street, for she drave her carriage over the body of her father, and so went on to her house, having the blood of her father upon her wheels, aye, and upon her own garments. And as the reign of King Tarquin began with blood, even so also did it end.